There are many ruins dotting the landscape of Kana, especially in the northern continent of Vithland where the remnants of old manors and castles litter the landscape. Most are forlorn and ill-trodden places, overgrown and generally best left avoided. 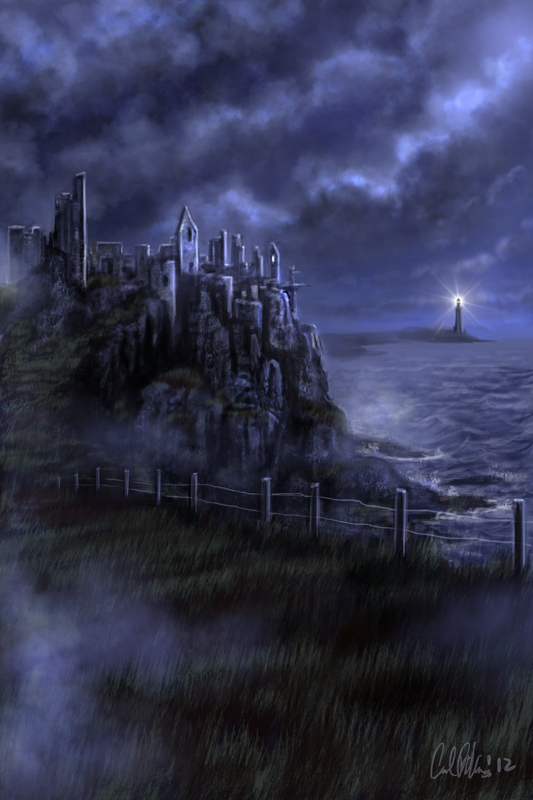 One notable exception is the Ruins of Caroline sitting in the green lands of Hala near the Straights of Elder under the eye of the Sisters’ lighthouse. The ruins of the fallen manor are frequently visited. Inns and pubs nearby do a brisk trade of those travelers seeking to visit them. The locals frequently go to the ruins and tend to the grass and keep the footing level so that visitors unfamiliar with the terrain won’t hurt themselves. The House of Caroline was a Great House of Hala stock. Like most Halas, the Carolines were simple farmers and tillers of the land. They were well-liked, generally followers in the complicated social scheme of Kana instead of pacesetters. They had many friends across Kana. Caroline Maidens were known to be very beautiful. The Carolines were known to be quite tall for Halas, taller even than the Vith. The Sisterhood of Light diagnosed them with the early onset of Giantism. The Carolines were one of twenty-five Great Houses to flee the League during the Great Betrayal in 000000AX and become Xaphans. Most of the other fleeing Houses were mal-contents and rabble-rousers: The Burgons, the Zary and Trimbles. The Carolines, however, were content league citizens–it was the House of Zary, a rather wayward House, that cooerced the Carolines to leave the League with them. So, broken-hearted, the Carolines boarded their ships and left their beloved manor by the sea behind. The Carolines wandered the empty passes of Xaphan space for months. They were raided by several other Houses, including the House of Zary, who were starving in their transports. In danger of becoming extinct, the Carolines put out a distress call, which was answered by the League vessel Victor. With the Victor’s help, the Carolines settled on a gray world in the Tu Mervolin system. There, the Carolines thrived, becoming Xaphans (technically, enemies of the League). The Carolines, however, always maintained friendly relations with the League and, during the Battle of Mirendra I, provided safe harbor for damaged League vessels, saving many lives. For their part in the battle, the Sisterhood of Light reinstated the House of Caroline’s familial patent in 003152AX, making them dual League/Xaphan citizens. The abandoned Caroline Manor fell into ruins over the centuries, the grand estate tumbling down and blackening. The Lords of Hala went to the Sisters and demanded they be permitted to raze what was left of the manor and rebuild a new House there. Their request was denied and Caroline remained a ruin. An interesting legend and fad arose over the years regarding the Ruins of Caroline … as time and time again, the ruins were not completely abandoned. 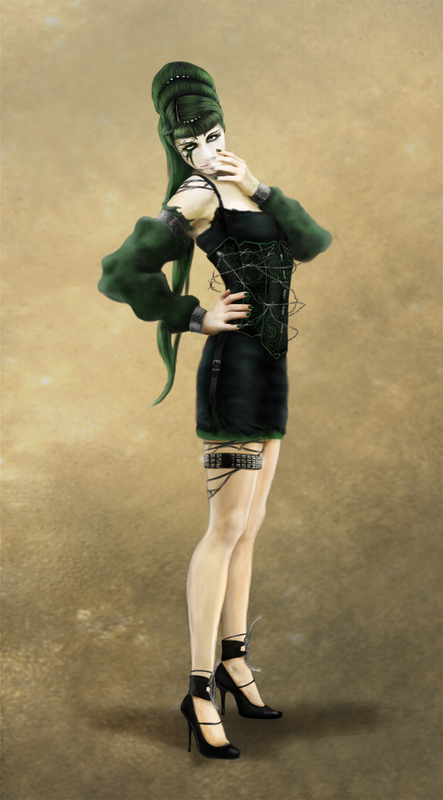 The House of Caroline’s LosCapricos weapon is a strange garter-belt-like device called the VERY MARY. The VERY MARY, when worn by a Caroline maiden, will spirit her away from danger and return her to her ancestral holdings: the Ruins of Caroline near the sea in Kana. Over the centuries, Caroline maidens grew taller and taller and became more and more adventurous. Often times they found themselves in mortal peril, and many times they found themselves standing alone in the ruins under the Kanan moonlight. In 000272AX, Eon of Caroline was about to be sacrificed in Burgon and was saved by her VERY MARY. She wandered the ruins and, driven by cold and hunger, made her way into the countryside to locate shelter. She was met by Zal of Thompson, a lord from a nearby Great House and was welcomed into their home. Soon, Zal and Eon fell in love and he made her his lady. Eon was well-liked, and when word of how she arrived on Kana got out, gentlemen seeking a fine bride began venturing out into the ruins, hoping to encounter a Caroline maiden from nowhere as Zal had done. The fad became popular and gentlemen from all over Kana and elsewhere flocked to Hala to take their turn sitting in the ruins under the moonlight. They brought with them flowers and candies, and gifts of jewelry. They wrote heartfelt letters and placed them by a remnant of masonry that became known as the Heartstone. The fad might have faded, as many often do, however, occasionally the gentlemen’s efforts were rewarded with success and the pratice perpetuated itself, eventully becoming a cottage industry in the region. As with all things, there were those who sought to take advantage of such a quaint fad and turn it to their own ends. Such was the Carofab: a local lady who disguised herself as a Caroline. Kanan ladies became rather jealous of all those eligible men going to Caroline to seek romance. They developed a rather sophisticated spy network so that they could know exactly who was going to be sitting in the ruins and when. When a desired gentleman was slated to be out there, Kanan ladies hoping to catch his eye would dress themselves up as a Caroline and meet him there. Lady Constance of Belmont-South Tyrol did just such a thing and won a husband for her efforts.